Talent development is the best way to ensure you company has a pipeline of promising staff that are both engaged and skillful to help you grow and improve. Whilst buying in talented people can be effective the identification and promotion of talent internally has a ripple effect across your organisation to help incentivise staff and improve morale. If others see that there are clear career paths open to them they will be more productive and demonstrate the types of behaviors that you wish to promote. 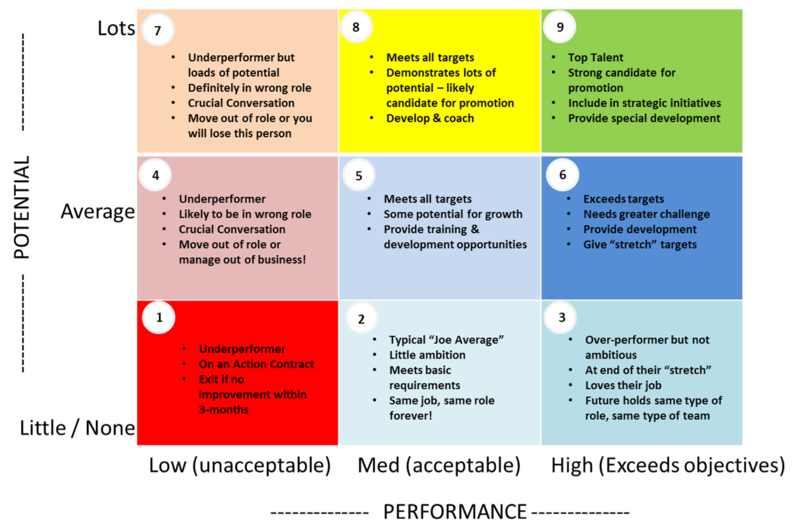 One of the best ways of identifying talent is to use the 9 box Matrix system of categorising employees. This should not be done in secret but be a very open and honest discussion between manager and employee. The 9 box matrix contains different areas which determine two factors, their performance and their potential. Each employee is positioned in a box, best to keep this simple as some people like to have the position within the box as a factor. Firstly the manager and employee should mark where they would place the employee, it can often lead to disagreements but it is good to identify and address some behavioural observations that have been made about the employee. It can also mean that perhaps the manager assumes something about the employee. Most businesses need a large number of employees in boxes 2,5,6 and 3 who have acceptable or high performance but have little or no potential to move forward. This is not to say they could not be trained to do a higher grade position but it means they perhaps do not wish to progress as they enjoy their job or their job is in an area where promotion may not be possible unless a new skill was developed. But these people will always be the bedrock of any success by ensuring the work is done well. Those in box 1 should be actively managed out of the business. They would have been identified as lacking the requisite skills for the role and all training interventions undertaken have not improved the situation. If this box is used frequently in your organisation then you may wish to determine the length of service of those falling into this category as it could point to a deficiency with your recruitement process and if the process is outsourced to agents can be used to give direct feedback to those agencies to help improve future joiners. Those in box 4 and 7 should be moved out of this box within 6 months or fall into box 1. This can be done by targeting training to their particular deficiency. It may also be wise to provide a mentor to those in box 7 as they will be a valuable asset should their current performance improve. Boxes 8, 9 and 6 are those that should fill any job vacancies at higher positions and providing working groups and mentors will help to keep their ideas fertilised until an opportunity present itself. One final thing to consider during this classification is that on a micro level it is often difficult to identify how the individual would move to the next box so ensure your management are clear on how the path to the next box whether that be vertical or horizontal is achieved. On a macro level this grid will give you great insight into your organisation and working on percentages can really tell you if you have a good workforce or if perhaps more should be done with training or engagement. A box with more employees to the left should identify overall training deficiencies and a box with more to the bottom will identify a problem with staff engagement.